A New Birth of Politics? Suddenly it seems as if everyone in the political world is talking about Steven Spielberg's splendid film Lincoln. Instead of the standard Hollywood hagiography, it is an act of civic virtue: a movie about a living, breathing, horse-trading, occasionally mendacious genius of a politician. It resurrects the noble greasiness of politics at a perfect moment: we need some inspired horse-trading in Washington right now, with short-term stimulus, long-term deficit reduction, health care and other issues on the table. As I watched the film, I couldn't help thinking about Senator John McCain. Not the current embittered McCain but the earlier version--the reformer who tried to clean up the political system. He was right about campaign-finance limitations, though thwarted since by the Supreme Court. But he was profoundly wrong about earmarks, those tiny emoluments doled out to individual members of Congress for works, good and not so good, in their districts, often in return for their votes on larger issues. McCain railed against them, reciting the more ridiculous examples--a study of moose mating habits, the Whac-A-Mole hall of fame, whatever--that made them seem corrupt and ultimately made them toxic. They shouldn't be. Earmarks are a useful lubricant for the great gears of legislation. Lincoln obviously loved them. In Spielberg's film and Tony Kushner's brilliant script, Lincoln doesn't compromise his principles to win passage of the 13th Amendment. He compromises his morals, a little. He trades jobs for votes. He pulls a Clinton--lawyering the truth--over the question of whether he's about to commence negotiations with a rebel delegation. That was the miracle of Abraham Lincoln, politician. He pursued the high purpose of moving justice forward via the low arts of patronage and patronization. Indeed, in a democracy, it is usually the only way great deeds are done. If he'd been negotiating Obamacare, Lincoln would have made the infamous "Cornhusker Kickback" deal--$100 million in Medicaid funds for Nebraska to secure a Senator's vote--in a heartbeat, even if the press howled as it did when Barack Obama agreed to it, forcing its cancellation. Which raises another point: if we're going to resume dealmaking in Washington, my colleagues in the media are going to have to get off the high horses we mounted when, in the wake of Watergate, exposing "corruption" became the surest path to journalistic gold and glory. We're going to have to stop the nonstop cynicism about politicians and start celebrating those who have the genius to find consensus, even when it gets messy. We need to be less puritanical about politics. 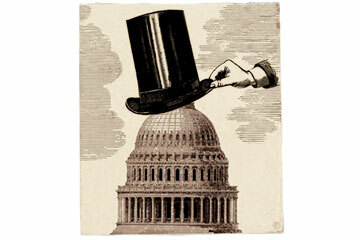 What would Lincoln do about the fiscal cliff? The answer seems obvious. He would narrow the debate where necessary--on the revenue side--while expanding it to make more-creative long-term judgments about spending. He'd set a revenue figure, let's say $2 trillion, and allow politics to run its course toward a $1.5 trillion-or-so compromise, with the actual menu of rate increases and loophole closings subject to the convenience of the pols. On the spending side, he would probably have to look at health care in a new way.